My blog turns two this week. In a few days, if I can count correctly, I will have brought it well beyond its birth and led it wobbling into toddler-hood. As I said two years ago, I’ve hoped here to document my encounters on the edge– living in underdeveloped countries, like Haiti, where luxuries were lacking, living with the challenges of bipolar disorder, an illness I was diagnosed with more than 20 years ago, and having lived, as a child with a father in organized crime and a mother whose religious beliefs sometimes seemed extreme. As much as I might like to blame the mafia for my later developing a chronic mental illness—having the FBI repeatedly knock down the door of our house, having my father indicted by a number of grand juries—that in and of itself was nothing compared to the crazy-making impact of my parents’ bizarrely, hardly compatible world views. Yet (and this is so important) my parent’s differences also taught me a lot about embracing the otherness inherent in both disagreement and compromise. Both of my parents, despite their individual and foolish failings, taught me a lesson that blogging has surely reinforced—that only in taking the negative and redeeming it through the grace of grand and often agonizing defeat—do we learn of love and healing, hope and wholeness. Organized crime taught me much about both the smallness of ambition and the largeness that is loyalty, while what seemed the spiritual extremism of my mother mirrored for me so much more than the minus of hypocrisy. It taught me the lesson of grace and gave me the gift of God or love or whatever you want to call it. It taught me that life is good and the world is a wonderful, crazy place where we CAN find, not only healing and wholeness, but also the intangible magic inherent in each of these. Somehow it all adds up and amounts to more than itself in the end. Just like we can’t measure blogging’s success or failure in the math of stats, we can’t measure love with arithmetic or accounting. Wasn’t that the message of Obama’s acceptance speech the other evening? Yes, math and balanced budgets matter, but the blessings we can’t count mean more to us as citizens and people. This is who we are as both Americans and human beings. We count, but we also care. We lack but we also love. We are more than we seem, my friends. We’re doers and dreamers. So thanks to my readers for daring to dream with me these past two years. Because you care, we all amount to more. It’s our exchange of kindness and good will—these posts and comments—that make WordPress the healing haven it’s been for me. May the blogging to come be blessed with more of the same—the same love, the same light, the same crazy, redemptive story—the living, breathing myth that ‘s more than the fiction it might seem. We are story—but by the accounting that is narrative, we keep more than score. We manage, in fact, to soar. So story on, my friends, and, in doing that, amount to more. Thank you so much. May we continue to soar and sail, believe and blog together. 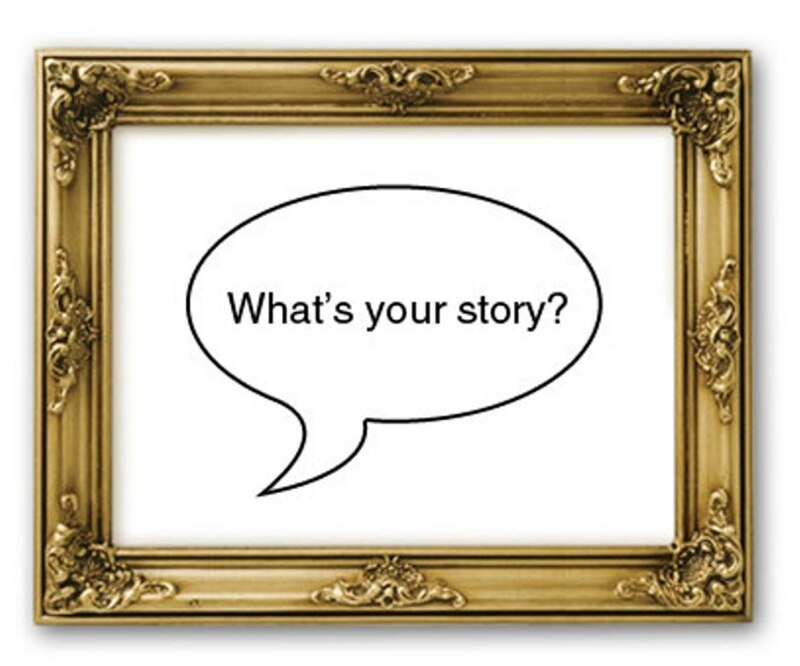 How has telling stories in any form added to your life? What might it mean to story on? Why do we do it? This entry was posted in Blogging/Writing, community, Friendship and tagged blog, blogging, community, friendship, grace, inspiration, life, Love, stories, story-telling, WordPress, Writing. Bookmark the permalink. Blogging is fun and finding new friends through the blog is the best part. Gosh, I have to agree with you, Deb! The friends are the best part. And who knew blogging would give them to us? “we are doers and dreamers” – well done! Telling my stories has helped organize my thoughts and helped me make sense of my wanderings through life. The connections and the “ahas” shared with others along the way enriched me in ways I can’t begin to express. Somehow, at least for me, I don’t usually arrive at the “aha” unless I write my stories down. It’s only in the writing that I achieve insight. Maybe that’s what makes me a writer. I’m so happy blogging has given you some of those aha-moments. Great to hear from you this morning, MJ! Happy birthday to your blog, Kathy! I think a lot of bloggers are reflective people who tell their stories to other people as a way to analyze and reflect on it themselves, maybe a bit like seeing a psychologist! And it can be healing! And a lot cheaper than psychotherapy… :-). Oh, it is SOOOOOOO much cheaper than therapy. I think you’re right that we are reflective people. And it’s been so much fun “meeting” folks like you, Gertie. Thanks so much for your comment this morning–all the way from South Africa. How’s that for blogging erasing distance, as well?! Gotta love Friday! Have a wonderful evening, my friend! I love how you connect others, and how you are so willing to write out your truth and bear witness to your life — I’m grateful that our blogs have brought us together and cherish YOU in my life, Kathryn!!! Betty, you are such a sweetie. Thank you. It’s actually an honor to share my life with folks like you. I cherish you, as well. What a gift you are to so many, my friend. Hugs to you today. Happy 2nd blogiversary, Kathy. It seems so strange that I’ve only “known” your for less than two years. It amazes me how much we learn from each other when we sit and ‘listen” to stories. So true. The need to share our stories is so fundamental to who we are as human beings, it sometimes amazes me. I know–less than 2 years, Lisa. Feels like forever, doesn’t it? Hell, you’ve been to our home twice already! Kathy, I so love your thoughts about taking in the negative and redeeming it do we learn about love and healing. How profound and true! It seems every time we try to sweep our pain under the rug it grows fiercer and more intense. I see more clearly that the gift of your two-year-old blog shines brightly through the transforming grace of your raw sharing. Thank you. It seems to me that there is positive we’re given along with each piece of pain that comes our way, if only we have the courage to look at that pain’s underside. There’s a magic, a grace, if you will, inherent in everything. At least that’s what I believe. Thanks for sharing in my celebration! Happy blogiversary, Kathy! so glad that I found you along the way!!! Writing down my stories–silly though some of them may be—makes me work through some of the things going on in my life in a public way and even though I am not really a “public” type person it helps to have the affirmation and/or insight from others as I share my story. I have always been a lover of words and this seems to grow the older I get. Blogging has become a support system in my life when I needed it most. I don’t think that I’m inherently public either. However, like you, I’ve found that sharing my story with others, not only blesses them (I hope) but it gives me a gift, as well. Somehow sharing is caring. And I love how you demonstrate that in your blog, Beth Ann. You take it even a stop further than most of us–and what a gift that is to organizations that benefit from “Comments for a Causse.” That giving for each comment actually allows you to give in two directions–out to the group the donation goes to–and back to those of us who leave comments. You give us the gift of giving–if that makes any sense. Talk about paying to forward! Thank you for that, Beth Ann. Great to hear from you! Remember that conversation about quotes hung up in your writing area? This is my new one. Rock on, Sista! Oh, yes, I remember. I’m honored to be added to your collection. And I am, indeed, rockin’! Hugs to you, my dear! I’m just so happy that sentence spoke to you. Happy blogging anniversary! I’m so glad I’ve found you here as I have found your stories delightful, redeeming and filled with the grace you have described. You’re a great blog friend my dear and I look forward to continuing to travel with you in this crazy wonderful world. Oh, Lisa, you’re a sweetie! I look forward to the same. It really is almost unbelievable the connections that blogging can bring. I’m honored you find my stories redeeming. Hugs to you, my friend. Good one, Kathy. We all grow up or “mature” with something that tries to drive us crazy. For me, it was the belittling that “befitted” a girl, and later, a woman. Try as I might, through education, effort, and achievement,.the respect accorded was rare, and the pay was niggardly (a word not meant to disparage any but those who doled it out). I think I’m working through a lot of that in my blog these days. Wow, what a powerful series that is! Thank God you were promoted to associate professor. It’s hard to believe how we still struggle with pay-inequity in the US–not to mention how some on the right want to deny the problem still exitsts! So happy you appreciated this post! Great to hear from you today. Happy anniversary. Meeting you, because of your blogging, has enriched my life. Thank you. Thanks you, David. You are such a sweetie. You and Colleen have enriched our lives, as well. Hope to see you all again sometime soon! Having my life nearly come to a sudden screeching halt at 55, nearly 9 months ago, and then being present for the rebuilding has been worthy of words. Therapy would not have brought me the community that has helped me hold on to the terrors and loneliness of recovery and it woulda cost a bundle! Thanks for askin’! <:-D I used to be so very private…. hee hee hee! What good did THAT do me?! I can’t even imagine what that must have been like for you, Laurel. What a blessing that you are recovering, not only who you were, but gaining all you want to become, as well. The come-back is arduous, I know. At least it was and continues to be for me. Love you, Laurel. You are such a sweetie. Thanks for sharing your life and your story with me–and so many! I know you know about comebacks, Kathy. It’s tiring, but on we go! You’re right. It can be exhausting. I have no doubt that you will come back fully, my friend. Oh boy! Ohboyohboyohboy! A secret part of me thinks so too, but daily life suggests otherwise. So, I’m drawing NO conclusions yet. You’re so right about blogging’s ability to alleviate loneliness. I actually hadn’t even thought of that. Thanks for adding that insight to the discussion. Hope you have a great day. Happy blogging anniversary! We all celebrate the gifts you have brought us with you writing. Thank you, Charlie. It’s always lovely to celebrate with you, my friend–and to enjoy the gifts of your poems. Happy Thursday. I love my blog family…a non-judge mental place where we can all release our inner lunatics that we suppress in real life. Congrats to you Kathy! You’re one of my fave bloggy people! Tell you what, Jamie, you are one of my favorites, as well. YOu are just so damn much fun. Hope you and Lisa and Tori and I can meet one of these days. Wouldn’t that be fun?! that would be fun! I think I have the best climate…time for a CA vacation!!! One of these days, if I ever have the funds to travel that far. I won’t be able to make that trip any time soon, I’m afraid. Before I started blogging, I would have thought connecting with people on the internet (apart from Facebook – um, not “really” connecting) was “virtually” impossible. I’m so glad to have been proven wrong. And so glad to have the privilege of learning your story through your wonderful posts. Isn’t that the truth?! I wouldn’t have guessed either and might even have said it didn’t really happen. But it does, damn-it. I have met a number of my blogging buddies in real life and they have also become in-the-flesh friends. My partner and I have even attended the wedding of one. Hugs to you too, AA. Oh, thanks so much, Mark. Your story is among the best, my friend. And I know what you mean about making so many friends via blogging. It’s like I said a few posts back–blogging functions as a front porch of sorts, allowing us to create global neighbors. I’m so happy to have you among mine. Congrats on your two years! you’re made of sterner stuff, hon, and I admire that. Keep it up..you’re one of my fave muses!!!!!! Thanks, my friend. I suppose I am made of some seriously stern stuff–though if we consider that Rove video from the other evening, that “stuff” might not be for the best. LOL Great to hear from you! Congratulations and many happy birthdays Kathy. I sometimes feel as if my blogging buddies are closer, and more real to me than my flesh and blood friends. When my mother passed away last year the outpouring of support from all those bloggers whom I’ve never met, and most probably never will as some of them live half way round the world, almost knocked me off my feet. I’m so very glad my blogging fingers led me to your door. Inspired by the fearless honesty of your writing, I’ve taken a few tentative steps in a similar direction. Thank you. How wonderful that you got so much support from fellow bloggers when your mother died. I’m sorry to hear that you lost her, however. I wonder sometimes if we share more deeply on our blogs because we do it by writing rather than face to face. In other words, we might feel free to say things we might not face to face, and people really respond to that authenticity. I don’t know. Fascinating. Happy birthday, R.T.E.H.! By all means, “story on” for a long time to come – yours are among the most interesting online tales anywhere! happy, Happy, HAPPY blogging birthday to YOU! Thank you, Laurie. It’s hard to believe it will be two years. Great to hear from you! Blog on Kathryn, Blog on. I shall, Jessie. For sure. Thanks! Congratulations on your milestone, Kathy!! Thanks so much, Andra! Great to hear from you today. Thanks so much, Nicole. I hope this year is as terrific as the precious two. Thanks, Nicole. It’s been a great 2 years. Thank you, my dear. I hope the words don’t stop anytime soon either. Great to hear from you. Have a lovely evening. Kathy I just have nothing more to add than you are brilliant. What else NEEDS be said? SOrry I can’t be more brilliant myself tonight…. LONG day at work. Just getting to my comments and blog readings…. This made me feel very good, on many levels. Oh, sweetie, it’s just lovely hearing from you. Relax. Kick back. You have a bike accident to recover from! No wonder you have little left. Hugs to you too! Happy Anniversary and while the last two have been wonderful here’s looking to the future..THANK YOU! Amen, Chris! Gotta keep these anniversaries coming. Dare not stop writing now! Great to hear from you, sweetie! Thanks for celebrating with me. I’ve always enjoyed writing or telling stories, whether real or made up. I think that’s why I went into journalism. In my job I get to tell stories from other people and in my blog I can tell parts of my story but I don’t really go into to depth about my life story. Mostly because I wouldn’t know where to start. Maybe I will open up a bit more about my background in future. Blogging is great for telling stories but I’ve also started a project for National Novel Writing Month where I’m writing my first book. I’m not sure if you have something similar where you are. Oh, wow, Megan, congrats on the book writing effort. Lots of folks around here are participating in the same project–NaNoWriMo. Can’t wait to here how that goes for you. Also, I know what you mean about not knowing where to begin telling your own story. I felt that way for years and still do to a degree. Hope you have a wonderful weekend, my friend. Having found you I am blessed. Happy anniversary. Thank you so much! I’m delighted to have found you, as well, Valentine. Have a wonderful weekend. Bountiful Blessings, my Bloggy Friend. Story on! Thanks, Sandy. Same to you. Hope you have a lovely weekend. Beatifully written Kathy, and so true. I’m so glad you enjoyed this one, Jackie. Great to hear from you this lovely Friday. So well said! It’s easy to embrace people who are just like us, much more difficult and compassionate when we can embrace people who aren’t like us – in whatever way. How special that your parents taught you that. Hugs to you! Have a lovely weekend. Thanks so much, Jackie. It is easier to like those who are like us. Difference, more often than not, makes for a more complicated relationship. Hope you and Reggie have a great weekend, as well! Beautiful post, Kathy! I like your President and loved his speech. It is so true. He does have a tough job to do though. I hope he gets lots of support. Thanks for sharing how blogging has changed your life. That is so wonderful, Kathy! Congratulations, Kathy, on reaching your second anniversary of blogging. Once you start, it’s a commitment. But well worth it, for all the friends you make, and for the wonderful outlet it provides each of us to share our stories. On another note, I’m currently in Seattle where I’ve been trying to share your blog with my friend, particularly to show her all your beautiful craft work, but Kathy, it’s kind of hard to find. I scrolled all the way back to March to find the coffee table you created. Anyway, on behalf of those of us who enjoy your art, please consider creating a craft page to make it easier to find them. Thank you! Thanks for stopping by during your travels, Monica. I’m happy to hear from you. You are one of the blessings blogging has given me! I will work on an Art tab. Sara has said this same thing for a while. I have just not remedied it. Thanks for reminding me. And THANKS for trying to share my work with your friend. I’m honored. Thanks so much, Heather! Blogging has become a hugely meaningful part of my life. Thanks for being a part of that! A big congrats to you on your second blog anniversary! You have such a thoughtful, warm, and welcoming place here. I thank you for that and for sharing your stories with us. Cheers to many more years ahead! I’m delighted you find my place welcoming. I’ve tried to achieve exactly that atmosphere. Thank God, I’m in the ball park, so to speak. Thanks for stopping by. I love hearing from you, dear Darla! Congratulations on you Blog Birthday! So glad we connected and remain connected! Telling stories through blogging, for me, is the way to find my voice. And the bonus that I didn’t anticipate was making so many online friends in the process. Part of what I love about you, Terri, is how LONG you’ve been blogging. It must be fun to have recorded so much history. I’ve LOVED meeting you, too, my friend. Hugs to you–and thank you! Happy Anniversary! Kathy, I can’t believe you’ve only been doing this for two years which makes me, at 2 1/2 years, practically a veteran. Which is ironic since I always thought you the veteran and me still a newbie. Go figure! But seriously, I love your blog, your stories. You have such a way of engaging your readers with your fascinating life and art, and your tales of Sara, and the melange of dogs in your home. Keep on blogging, my friend! Thanks for the anniversary wishes, Monica. In some ways it seems like I just started and in other ways like I’ve been doing it forever. I did have a blog for a number of months when we lived in Vietnam, but no one read. I didn’t even know about tags. I was so, so ignorant. I have imported those posts here, however. But they’re not really worth reading, I’m afraid. Congratulations on the blogging milestone, Kathy. It warms my heart to see your blog expanding and attracting the comments and relationships that you so deserve! Cheers to another 2 years (and more) ahead! Oh, thanks, Dana. It’s been fun getting to this point. Great to hear from you. Hope you and Marty have a wonderful weekend. “It’s our exchange of kindness and good will—these posts and comments—that make WordPress the healing haven it’s been for me. May the blogging to come be blessed with more of the same—the same love, the same light, the same crazy, redemptive story—the living, breathing myth that ‘s more than the fiction it might seem.” This to me, reads like a blessing. May we continue to bless and be blessed. Thanks so much, Joss. I suppose it is a blessing, indeed. Great way to put it. Can’t tell you how happy I am to hear from you. Hope you’ve had a lovely weekend. it’s always a pleasure to visit here. For some reason your posts have not been showing up in my reader, yours and a few other favourites, so this weekend I went looking! Glad I did. And, for me, you are one of those wonderful folks! Thanks, my friend. Glad you’ve had a relaxing weekend.